Now this is intriguing to me. The Skeptic Family blog posted this article this week about people who can stop wrist watches. Growing up, my Dad was one of those people. He had a box of watches that would not run anymore in his bedroom. In my memory's eye there were a half dozen watches in that box. Unlike the situation in the Skeptic Family post, Dad's issue was with mechanical watches. I recall sitting on his bedd with those watches and trying to wind them and get them to work. They wouldn't even wind! Okay, so 35 years later I'm thinking - those watches probably didn't work because they were - ta-dah! - overwound. Dad eventually solved the problem when the earliest digital watches became available. I remember being very excited that he was getting a digital watch for whatever occasion it was - his birthday, Christmas, Father's Day. He has never looked back. In fact I think his current watch is a battery driven standard analog watch. But wait! There's more! It turns out that the ability to stop watches was inheritable. I used to stop watches just by wearing them too. As a child I don't know how many crappy watches I went through. Lots. You know the kind. Made mostly of cheap plastic, couldn't keep accurate time for more than 12 hours running. It's no wonder thos watches quit working. They were all but designed to! I really only ever had two decent watches as an adolescent. The first was a Timex with (I have no idea why.) 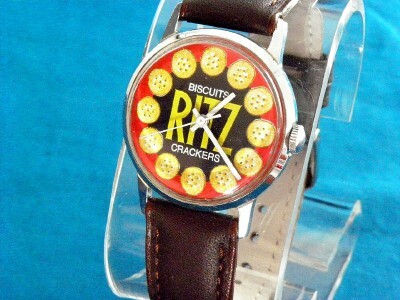 a Ritz cracker logo on the face. I wore that thing a lot, (Again I have no idea why.) and rather indiscriminately. It endured 'X' many games of Dodgeball, and went with me tree climbing and jungle swinging - which were both nearly daily activities year round in my semi-rural home domain. In winter it went sledding. As you can see from the picture, this really wasn't a sports watch. It took a beating and kept on... on, no... actually it didn't keep on ticking. 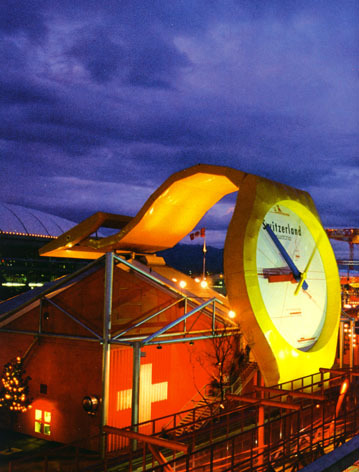 The second watch of note was a Swatch bought at the Swiss pavillion at Expo '86. I don't specifically recall how it met it's fate, but clearly when it stopped working I saw a pattern. Just like Dad, watches simply stopped working when I wore them. Would I have noticed the pattern without his previous example? Probably not. But I did have the example and I jumped to a conclusion. By the time I was in University I had quit wearing watches all together. It was an obvious waste of money, 'cause I did them in like (ahem) clockwork. Funny thing is, I have roughly the same relationship with sunglasses. I generally buy either cheap sunglasses or don't bother with them at all, because I just can't take care of them. I have a head count where sunglasses are concerned. I know it's not 'cause of some weird power. I simply abuse sunglasses and they don't last, so why spend good money on them? I can't say why I didn't just do the obvious thing and switch to a digital. I had been so excited as a kid that he was getting a digital, and by the time I was a teenager digital watches were pretty darned cheap. I guess maybe I was attracted to the idea of this "special power" I had, and that switching to digital would be doing an end run around it and I would quit being special? I guess. So I quit wearing watches altogether. It's actually pretty darned easy to get along without a watch. There are SO many clocks in the world. When you don't carry one on you, you quickly get to know where all the local ones are, and habitually check them for reference even if you don't need to know what time it is this very moment. Even when you are somewhere unfamiliar you develop strategies. You begin to recognize where the likeliest places for clocks to be are, and I expect you also develop a pretty good internal sense of time. Before too long, the assumed "fact" that I stopped watches faded into the background and not wearing a watch became habit. Times of course change. And one day - six years or so ago - I bought a cellphone. It, of course, had it's own internal clock. So now, why would I ever need a watch? I've got a clocked that is synched to Greenwich Standard with me nearly everywhere I go! Somewhere between having not wearing watches become a personal habit and the time I realised that I was a skeptic I totally forgot about my "special power." I didn't even think about it until I read the post on the Skeptic Family blog. Funny how these things go. So yeah, I severely doubt watches stop when I'm wearing them. I am all but certain it was little more than confirmation bias. I'm not going back to wearing a watch though. I've got the cellphone. I DO have a watch. It is actually a quite nice Rolex my Mom gave me for Christmas several years ago. I have worn it twice. Once to try it on when I first got it, and again just before Christmas this year, as a piece of jewelry for Jodie's company Christmas party. I didn't even wind it up. I just kept using my cellphone when I needed to know the time.